A lot of us have one semi-annoying friend or acquaintance that seems to have absolutely everything — a wonderful significant other, a great place to live, the perfect job (or lack of job) and generally never seem to have a care in the world. But even if that’s actually true, it can still take just an instant for that fantastic life to fall to pieces. In the German short film Maren, that instant comes in the form of a fatal car crash. The title character (Margitta-Janine Lippok) is a woman who has it all. Besides the usual things meant by that phrase, she also has a zest for life, taking pleasure in the small things that are so easily overlooked. On the night that changes her life, her beloved husband is coming back from a business trip and Maren has planned a romantic dinner at a nice restaurant to welcome him home. Death, however, decides to crash the party, and I’m not just making a bad pun — after she gets the terrible phone call about her husband, Death (Max Tidof) sits himself down at her table for a chat. Death takes his best shot. This could never be an ordinary chat, of course. Maren wants her husband back, and Death is more than willing to talk terms, or at least he claims to be. But these are the highest possible stakes and Maren has an impossible choice before her. Death might know (or think he knows) exactly how much a human life is worth, but how is a mere mortal to decide on such an exchange? If you can’t cheat Death, as the saying goes, you probably should never try to negotiate with him, either, but Maren is desperate. 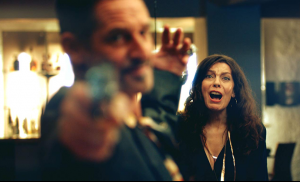 The film deals with many facets of the human condition without ever becoming preachy or condescending. Whether your life is wildly successful or you’re struggling through every day, we’re all the same as far as Death is concerned — all equally valuable and equally worthless. In the end, though, this film’s message isn’t nearly as dark as you might expect. To quote a very different movie, life finds a way, and perhaps that’s all that matters. Both Lippok and Tidof give pitch-perfect performances. Death is intense and often frightening, both wise about and ignorant of the humans he leads into the beyond, while Maren is the image of a woman facing the derailment of her entire life, struggling with the weight of sudden despair. It’s a powerful, wonderfully directed film that’s haunting and hopeful — because while Death may be everywhere, in the end this is the story of a mere mortal, and it’s Maren that shines through beautifully. Asking a group of comic fans who did the best interpretation of the Joker can be a great way of starting an argument. Between movies and voice acting, there are at least a dozen people who have portrayed the iconic villain and they’ve each given the character their own spin and collected their own group of supporters. But whoever your favorite is, there’s a very good reason why the Joker has become infamous — his madness gives him a strength of will and a certainty of purpose that most people simply can’t manage, and that gets things done. Of course, they’re almost invariably horrible things, but it’s still a lot of accomplishment. The Batman is one of the few who can hope to match him, and of course he’s not exactly mentally stable, either, so it’s no wonder that their opposition to each other has reached the point of legend. The Joker returns home to Harley after a long day of homicidal rampaging. Injustice for All is a fan-made short using the DC universe that daringly offers up its own version of perhaps the world’s most famous psychopath, played by Chris Newman. Here his instantly recognizable look comes from a rare genetic disorder called (appropriately) harlequin ichthyosis. It’s a real condition, though it doesn’t actually work quite the way it does here, and provides a refreshingly different reason for the Joker’s bizarre appearance, avoiding the usual scars and freakish chemical-based accidents. The movie begins in Arkham Asylum, where Harley Quinn (Erica Hoveland) is a closely-guarded inmate. A visit from Lex Luthor (Donavan Darius, also one of the writers) prompts her to tell something of her and the Joker’s story, and with him involved you know it’s a doozy of a story. The plot is inspired by the popular video game Injustice: Gods Among Us, and it’s a tale that rocks the whole DC universe, featuring as it does a nuclear device, the destruction of a good chunk of Metropolis, and a rogue Superman. But it was the Joker’s machinations that started everything, and if anyone knows anything about the Joker, it’s Harley — though of course she isn’t going to be the most reliable of witnesses. Many of the DC favorites are here, including Catwoman (Jamie Bernadette, 4/20 Massacre), Lois Lane (Julia Voth), and Jimmy Olsen (director Danny Mooney), and every character rings true. 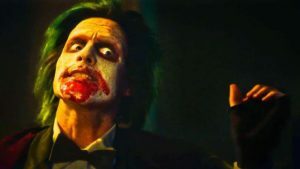 It’s a beautifully cast, wonderfully written homage that gives the Joker just the right combination of pure psychosis and the very darkest of dark — yet strangely whimsical — humor. It’s got to be pretty intimidating to play the Clown Prince of Crime himself, but Newman’s performance shines among many excellent performances. Check out this film, and you might just find yourself a new favorite Joker. We all know the things you’re never supposed to talk about on a first date: politics, religion, and past relationships. Sometimes, though, despite knowing we shouldn’t and despite our best intentions, we still somehow find ourselves ranting about the last election or saying something vaguely rude about the Pastafarians and then discovering that your date is one. 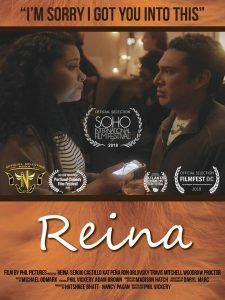 In the short film Reina, our first glimpse of Seth (Sergio Castillo) is of him telling a long, emotional, clearly not appropriate for a first date story about being cruelly separated from Reina, his longtime love. Meanwhile, Seth’s date Michelle (Kat Pena) is playing on her phone and occasionally almost pretending to care about his tale of woe. So you know there’s very little chance of a second date at this point. Michelle takes a break from texting the gory details to her friends. Realizing his mistake, Seth apologizes profusely and manages to talk the apparently extremely forgiving Michelle into starting over with a drink at the bar down the street. Unfortunately, they realize too late that they’ve walked into a dangerous situation, as Dmitry, Sergey, and Vlad (Ron Orlovsky, Travis Mitchell of Partitioned_Heart, and Woodrow Proctor) are up to no good. For a while, it seems as though this is one awkward date that might end up as a tragedy instead of just a horror story to share with friends. 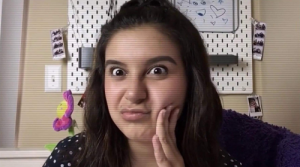 But much to everyone’s surprise, it seems as though Reina — or at least her full, sad story — just might change everything. 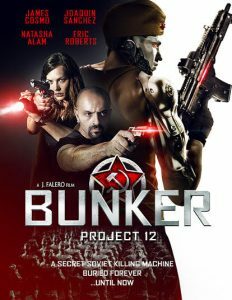 Despite how dire it might sound, this is absolutely a comedy, with Dmitry’s gang sometimes in danger of stealing all their scenes with their antics. But it’s also a comedy with heart, as it delves into some of the more painful experiences all humans share and how they can help bring us together — even with people we might normally be terrified of. Pena as Michelle speaks volumes with her expressions, clearly often convinced that she’s the only sensible person in the room. Castillo’s hapless Seth is a decent guy but also seems to be one of those magnets for trouble and bizarre events, and sometimes seems to be barely muddling through. The end result of throwing all these characters together is a charmingly funny film that’s both sweet and a little zany, realistic and over the top. It’s one of the worst — and the best — first date stories you’ll ever hear.